Jump to the Table of Contents for this site. Science features MOLA results in their May 28, 1999 Issue. Science magazine's cover shows 3D Mars. If you have Quicktime, here's a 3D movie of Mars by CNN. 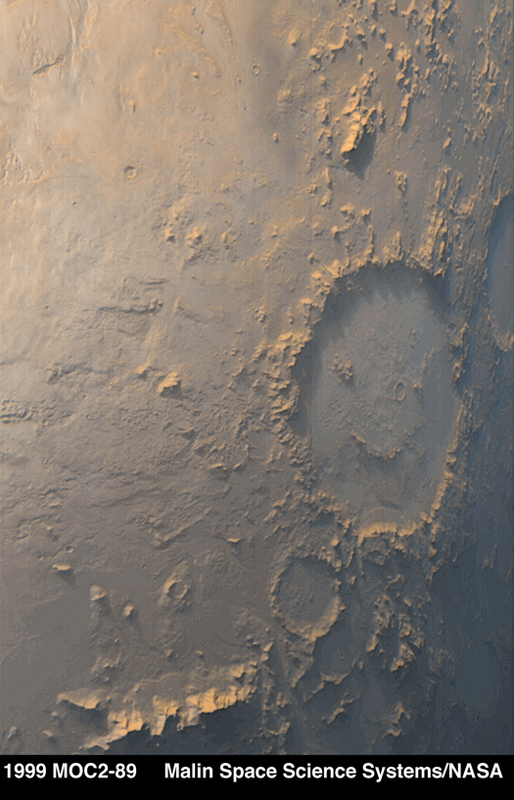 And check out the Mars Smiley Face Crater! For all the latest information on MGS and MOLA, visit the new MGS Web Site. For the latest information on all the NASA Mars spacecraft, Visit the Mars Missions Web Site. 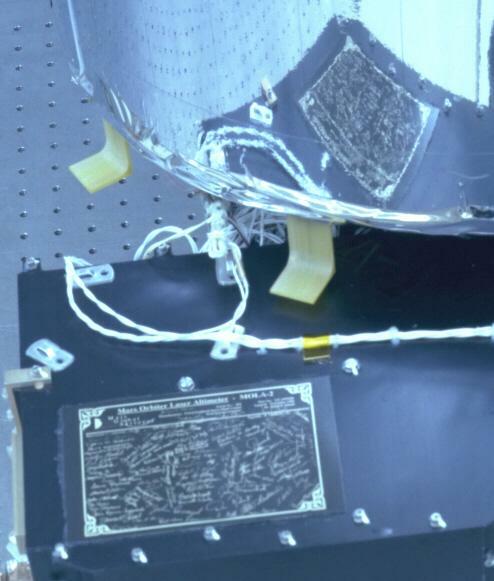 "The MOLA instrument was commanded off on 6/30/01 at around 6 pm EDT when the MGS telemetry indicated that its laser operating temperature had dropped to a preset lower limit. Until the anomaly, the laser energy had been nominal and steady at about 20 mJ/pulse. The 6/30/01 event was the first anomaly in MOLA's operation since the MGS launch in 11/96. "At the request of David Smith, the MOLA PI (principle investigator), several remaining members of the MOLA instrument team have been analyzing the available MOLA data reported before it was turned off to try to determine the most likely cause of the anomaly and as well as to recommend a possible recovery plan. Their analyses to date indicate that the likely cause appears to be an interruption of the 10 Hz laser trigger signal from the MOLA altimeter electronics. Without the trigger signal, the laser would not fire and its temperature has dropped, eventually to the lower limit. It is not yet clear which electronic component might have been responsible for the signal interruption. We are planning to support several tests the week of 7/9/01 to see if, once powered back on, MOLA resumes normal operation and to configure the instrument to perform additional troubleshooting if needed. "As of 6/30/01, MOLA had been in space for 1696 days, and had undergone 216 power-on/off cycles. The MOLA laser had fired 671 million times in space and MOLA had made about 640 million measurements of the Mars surface and atmosphere. This represents more than ten times the number of laser measurements than all previous space lidar missions combined. The MOLA instrument performance and lifetime have surpassed all goals of the MOLA investigation. There been 35 peer reviewed scientific papers published on MOLA data to date. "The MOLA laser was designed and built by the McDonnell Douglas Corporation. 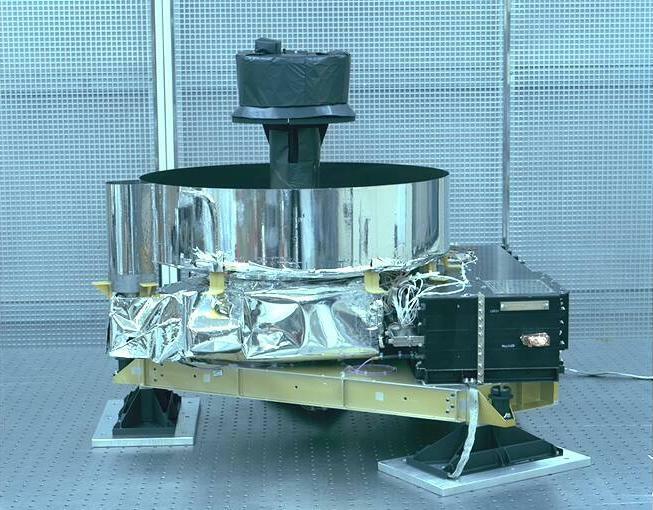 The MOLA instrument was designed and built under a "best efforts - fixed cost" basis by a GSFC instrument team led by the Laser Remote Sensing Branch." 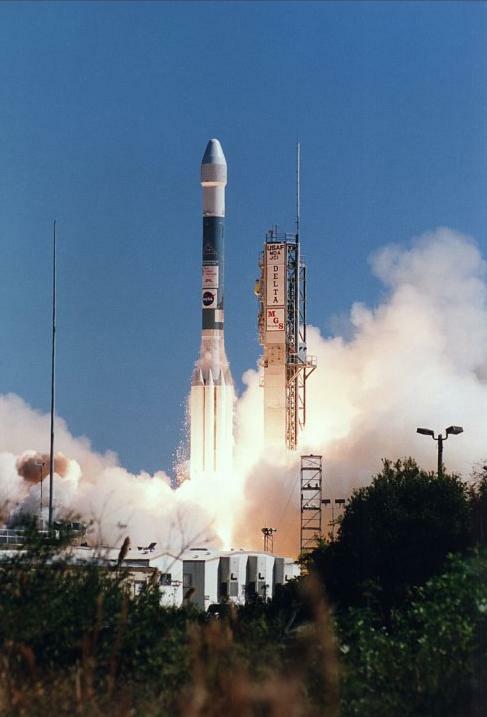 Mars Global Surveyor was Launched Successfully at 12:00:50 EST on November 7, 1996! MOLA was turned on in space for the first time at 04:30 a.m. on November 25, 1996. All systems worked perfectly. After its 10-month journey to the Red Planet, MGS arrived on September 11, 1997 at about 9:30 p.m. EDT. Due to a problem with one of the solar arrays, MGS will need an extra year to get into the proper orbit. This is because the engineers are not confident that the problem solar array can handle the aerobraking loads it was originally designed for. So instead, a much slower aerobraking schedule will be used. Mars Global Surveyor Has Acheived Polar Circular Orbit Around Mars! Kennedy Space Center has made some MGS video clips, an MPEG movie of the launch, and some excellent MGS images available. Read a Press Release on NASA's and Russia's exploration of Mars. Sadly, the Russian Mars '96 spacecraft failed to get into completely orbit. Two articles from CNN's website explain. These links take you to short descriptions farther down on this page. From there you can jump to the associated page. NOTE: Due to a finite element modeling error, which has been found and corrected, much of the data presented on these pages was updated during April 1996. The error impacted vibrational analyses most significantly. See below for a description of the error and the correction. 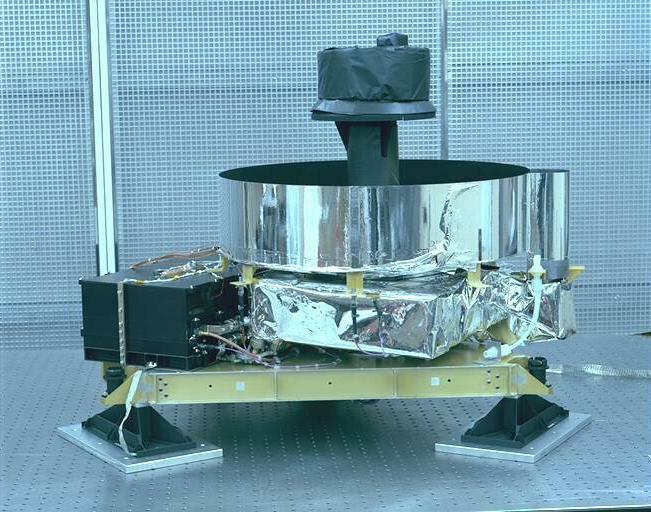 The Mars Orbiter Laser Altimeter, or MOLA for short, is being built by NASA Goddard Space Flight Center. It is one of four instruments on the Mars Global Surveyor. Some of you might recall the Mars Observer that was lost in '92 just after it went into orbit around the planet (those pesky Martians!). Well, this is the second attempt to get there and take some pictures. MOLA will send back to Earth such information as mountain heights and valley depths, as well as information on the surface reflectivity. It will do all this with a laser beam. If you care to learn more about MOLA, just send me a message at the address below. Or better yet, keep reading. The four pictures to the left are of the actual MOLA instrument as it was going through testing here at Goddard. They show what MOLA actually looks like. The top three pictures show various views of MOLA, while the last picture is of the plaque that all the MOLA Team Members signed. All of our signatures will be traveling to Mars with MGS. My signature is somewhere very close to the upper left corner. Unfortunately it cannot be read. So you'll have to believe me that it's really there. Jump to Goddard's MOLA page for another short description. Also, for more detailed information on the entire project, you can read the MGS home page, or go straight to JPL's own MOLA information page. Above is also a picture of a finite element model of MOLA. Better and more detailed FEM views are available by clicking on this picture. JPL's Mars Global Surveyor home page. Mars Thermal Emission Spectrometer Project (TES), which is another instrument on MGS. I have made as many of the MOLA mechanical analysis documents, pictures, and data available as I can. The documents page will give you a complete listing of what's to be found. Many of these documents will also be found on their respective Web pages you can get to from here. 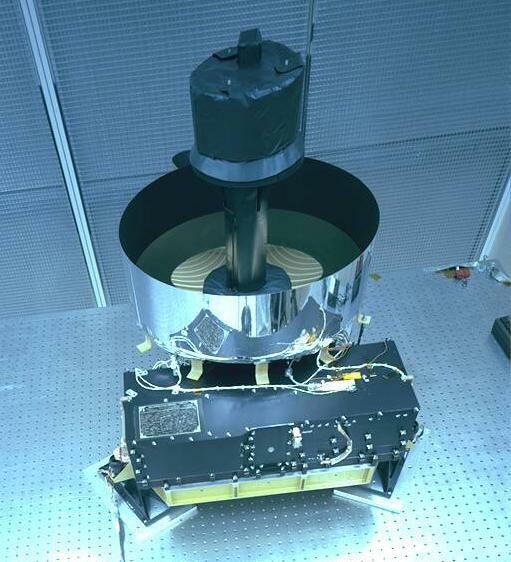 In December 1995 and January 1996, the MOLA instrument went through a series of environmental tests, which included vibrational tests like random and sine vibration. The results of these tests showed a poor correlation with the finite element model I created. After reviewing the test results and studying the model more closely, an error was found in the FEM. This section gives background on the test, the error and how the error was found and corrected. Various views of the MOLA FEM are available to look at. MOLA Finite Element Model Information and details are available for browsing. If you know a little about NASTRAN finite element modeling and want to become really dangerous, then my Branch (Code 721 here at Goddard) has a group dedicated to increasing our modeling knowledge. It is called FEMCI (Finite Element Modeling Continuous Improvement) and it has its own home page. Check it out. Please note, this is not an introduction to finite element modeling, it if for regular users of NASTRAN. Mode Shapes of the complete MOLA model including animated GIFs (requires Netscape 2.0 or some other compatible viewer). An explanation of modes and modes shapes together with example graphics is also included with the Mode Shapes. The Random Vibration Analysis is complete and the pages are available. Shaker point force limiting and input spec notching procedures used for random vibration testing. NOTE: The FEM error detected and explained above would have had a major impact on the results of the random vibration analysis results and the random test specifications derived from them. However, because the random testing was completed (and the instrument survived easily) before the error was detected, there is no need to redo the random vibration analysis. The results presented are organized exactly as they would have been had no error occurred. The Frequency Response Analysis is complete and the pages are available. Description of frequency response analysis. NOTE: The FEM error detected and explained above would have had a major impact on the results of the frequency response analysis results and the sine vibration test specifications derived from them. However, because the sine testing was completed before the error was detected, there is no need to redo this analysis. The results presented are organized exactly as they would have been had no error occurred. Pam Generie has completed a statistical analysis of the damage that could occur to the Primary Mirror due to micrometeor impacts. This page is maintained by Ryan Simmons, at .